Attendees at the UN Biodiversity Conference COP 14 in Sharm El-Sheikh discussed on Sunday progress on the implementation of the Convention on Biological Diversity as well as major issues including synthetic biology and the use of living modified organisms and gene drives. The global meeting officially opened in the Egyptian Red Sea resort city on Saturday, following four days of African ministerial meetings in the run-up. National governments and regional and international organisations discussed on Sunday progress on the convention's Strategic Plan for Biodiversity 2011-2020 and its 20 Aichi Biodiversity Targets. Participating countries gave updates on progress at the national level, with many developing counties calling for strong resource mobilisation, including financial support, capacity building and technology transfer. On digital sequence information (DSI), the EU on Sunday noted that public and open-access databases are an important form of benefit-sharing. The World Health Organization stressed that pathogen-related DSI as a global public health good, and urged its rapid and broad sharing. Many called for capacity building on contained use of Living Modified Organisms and strengthening research infrastructure under the UN's 2003 Cartagena Protocol on Biosafety. They also urged utilising the protocol's mechanism of Biosafety Clearing-House (BCH) for exchange of experiences. CBD Alliance, a network of civil society group concerned with the Convention on Biological Diversity, said that the "use of digital sequence information without benefit sharing is inequitable and a long term threat to this very convention." Countries also discussed the convention's supplementary agreement Nagoya Protocol on genetic resources, with many welcoming the proposal to synchronise national reporting under the convention and its protocols. This year, national governments and regional and international organisations hope to renew support for achieving agreed-upon global biodiversity targets for 2020 and to ramp up support for an ambitious post-2020 global biodiversity framework. Executive Secretary of the UN Convention of Biodiversity Cristiana Palmer has urged the international community to immediately work together to conserve global biodiversity. "If we do not act we soon may reach tipping points that may cause irreversible destruction to nature and ultimately humankind," Palmer said on Saturday. While the conference marks 25 years since the convention came into force, Palmer said that successes achieved ever since have not been sufficient to halt biodiversity loss, highlighting the urgency to choose a path of conservation, restoration and transformation. Reports suggest that biodiversity around the world is being degraded or lost due to a myriad of pressures including unsustainable use of resources, climate change, and habitat stress, as well as air, land and water pollution. According to the World Wide Fund for Nature (WWF), world biodiversity has declined by almost one third in the past 35 years, mainly due to habitat loss and wildlife trade. Egypt will be in charge of the convention for the next two years, following Mexico which held the presidency from 2016 to 2018. "Nature and humanity are not separate entities, and Africa is leading the way on the post-2020 global biodiversity framework," said Egypt's Environment Minister Yasmine Fouad, who chairs the conference. During the conference, which runs through November 29, governments are expected to present their plans to streamline biodiversity and nature into the decision-making of the major economic sectors of mining and energy, infrastructure, processing and manufacturing and health. Over 8,000 delegates from around 200 countries are expected to attend the two-week global gathering. 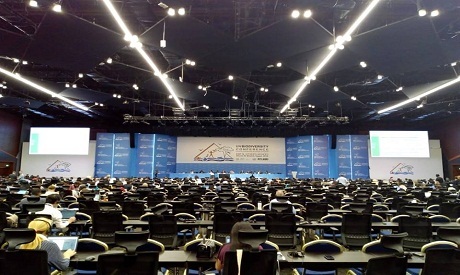 Attends include delegates from the convention's 196 parties as well as representatives of civil society, the private sector, sub-national governments and indigenous people.